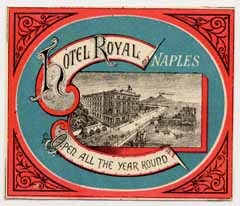 A review of hotel labels printed in the 1880s and 1890s will leave a first impression of similarity and, indeed, although the new decade brought improved graphics and a wider color palette it did not originate truly new label types. On the other side, in a 1900 travel scrapbook were found two relevant novelties not previously seen in scrapbooks of the late 1890s. 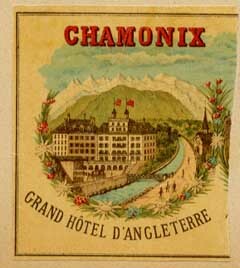 One was a label for a hotel in Chamonix in which the building was, for the first time, represented in a fully colored setting that was at least as relevant as the building itself. This means that the image was purposely done for the lithographic label, and not adapted from a plate image of the hotel done for general purposes. This label can be seen at right and the fact that it looks like just half a label results from the company having ordered one print for two hotels, each one using half of the whole. But the second novelty is much more important: for the first time a figurative label does not show the hotel building but rather focuses on a street scene and includes a local attraction (the cathedral of Milan)- see this label at right. There is something else new to this label, but we shall deal with it later, after absorbing the meaning of what has just been said. The building of a hotel (and particularly that of a town hotel) is often quite ordinary and the design of the label around it does not help to convey the feeling of exclusivity that early travelers were so proud of. On the other side, buildings are difficult subjects and lengthy to render, as there are many architectural details such as windows that must be drawn. If travelers want to show off to the world a mark of the places they visit, then why not design labels around local attractions, activities or surrounding scenery, much more open to artistic creativity and easy to design attractively? Thus was set the scene for the great Golden Age of hotel luggage labels! But I mentioned some other remarkable point about the Italian label above and we should now concentrate on its colors. The whole scene is represented in blue and black, with the cathedral silhouetted in white to make sure it would not be missed (the white parts of a label are often a ground color not covered by the later inking). The lithographic process requires that another stone and an extra printing cycle be used for each additional color, so that these should be kept to a minimum so that the process may be economically attractive. On the other side, true street colors are confusing and rather unattractively grayish. How much better would it be to use an unrealistic palette: only a few colors would be needed and both towns and scenery could be rendered with a maximum visual impact. This principle, exemplified at right, was the second spearhead that launched the Golden Age of hotel labels. Label designers did not invent either the publicity through the use of local attractions, or the creative use of fancy colors. 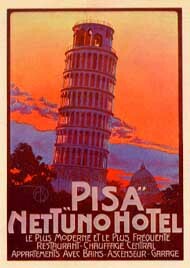 Both principles had been previously seen on travel-related posters, particularly of Swiss origin. But only around 1900 was it realized that the same principles could be applied to luggage labels and that these could actually be seen as small posters. 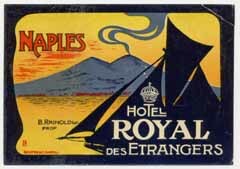 The fact that such understanding came slow probably stems from the fact that, at the time, posters and labels served entirely different purposes (be reminded that labels served solely the traveler's vanity and the time when hoteliers would see luggage labels as an advertisement medium was still to come…). In a few years the very same designs (eventually with different lettering) would be used in both posters and labels, whence the name "poster-labels" applied to the new brood of stickers. At right you can see a typical poster-label first issued in the 1910s. The new style did not take the world by storm. 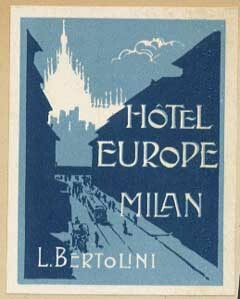 A set of 52 hotel labels collected during an extensive tour of Europe made in 1904 did not include a single label with the new look! On the other side, another scrapbook from 1910-11 gave a fair number of poster-labels, mostly from Italy and printed by the Neapolitan firm of Richter & C. After about 1912, old-style labels become increasingly rarer and probably those few of a dying breed represent the last remains of old stocks. In the next few years a succession of wonderful designs emanated from a select group of printers in Italy, Switzerland, France and elsewhere who employed gifted graphic artists and vied for a fair share of the booming market. Luggage labels were important items for printers because through them they advertised their own work to the world and that is why they so often marked them with their name. Compare, above and below, labels for the same hotel before and after the graphic revolution that marked the beginning of the Golden Age of hotel labels. An order of labels from an important hotel often meant a much larger scope of products than the labels themselves because the matter of what we now call a graphic image would come into play. A hotel owner or director might thus order, from a reputed printer, all the paper items that his establishment might need, including posters, menus, letter paper, notebooks, bill books, etc., all sharing the same basic image. Salesmen would visit hotels in distant towns or countries. The doings of such a competent and aggressive sales force is testified, in the case of Richter & C, by their many labels for Egypt and the Middle East and, particularly, by their labels for Swiss and French hotels, gaining over printers established locally. Obviously the history of the hotel industry shapes that of hotel labels and both depend on demand. Exquisitely designed hotel labels are often costly and usually stem either from exclusive hotels, or else from their less expensive but willing rivals. Then (as today) the expensive hotels in centers of diplomacy and finance such as Paris, London and Berlin catered for a much different set of customers than hotels in tourist's towns like Venice and Naples or winter spots like Nice, Cannes or Aswan. During the Great War it was business as usual for the large hotels in capital towns, but the tourist trade all but stopped. The demand for wintering spots in the warring countries dried, although some wealthy people that did not contribute to the war effort found quiet refuges in faraway lands where war was but a distant rumbling. Hotels in places like Nice were soon put to military use, often as hospitals for the thousands that were injured at the front. Even Swiss hoteliers sought some relief from imminent bankruptcy by renting their establishments to the Allies as supplementary bedding. 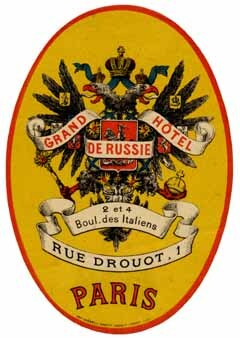 Hotels in Paris have used labels throughout the war and may even have ordered new labels made, during that period. So did hotels in countries not involved in the war. 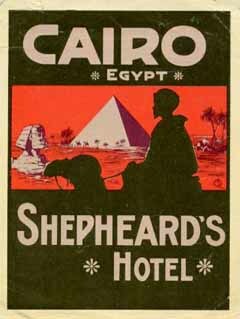 For instance, Mario Borgoni's 1905 label for the Cairo Shepheard's Hotel was reissued in 1917. But those hotels that spearheaded innovation in places like Nice, Grasse or Menton put their label remainders away in drawers as they gloomily saw the interiors of their Palaces all but destroyed in the name of the war effort, and wondered whether there would be a future for their business. When the war ended in late 1918, the requisitioned Palace hotels were kept in military use for some months longer. Some did not reopen as hotels, but most finally did so around 1920, after the plague epidemic that followed the war had subsided and refurbishments had been concluded. In some cases the old label stocks were again put to use, in other cases a change of name of the hotel or a new owner called for some adaptation or for new labels altogether. When hotels did not reopen or the former labels could not be reused, bunches of the old stock might find their way to collectors or dealers. These are the older labels that are so common today for no apparent reason, while most of the rest of the same vintage seem to be so very rare. Those must have been hectic days for label printers, after the meager war years when they had shifted to the printing of patriotic postcards and other war-related paper items. But it was not a time for innovative designs, let alone for new styling trends. 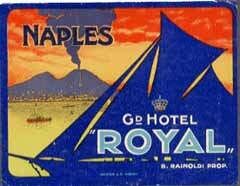 New labels were often made after prewar designs for the same hotel. Others were adaptations of prewar models, like the example at right which you may compare with the earlier label for the same hotel.